Produit conforme à la commande, rapidité pour la livraison, totalement satisfait! Envoi rapide, Satifaction au rendez-vous. Good technical knowledge provided at time of purchase. Delivered next day as promised. Battery in good condition and well packed. Hope it lasts as long as my previous Varta, fitted in 2001, that's why I wanted to fit same make. Gave it 5 stars based on last one lasting 17 years on a trickle charger. Adapté à: Honda quad ? 250cc ? An easy replacement gel alternative to the OEM Yuasa battery for my bike. A well known name at a very reasonable price. Very speedy next day delivery was much appreciated. Adapté à: Honda ST1100 Pan European 1100 2000 W reg. Excellent price and service for a top line product. 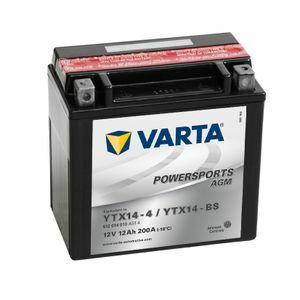 I ve used Varta batteries on a number of vehicles over the years. I got this battery because of the name and as I don't use the bike as much as I should it might last longer. The price was good and the person on the phone was very helpful I might add it come the next day thank you.